Your home is so much more than the place where you keep your things. It’s your refuge from the hustle and bustle of life; it’s the place where you’ve made so many memories. That’s why it’s so important to choose the right security fence for your needs. If you’re not careful, you could inadvertently install a fence that makes you a target for burglars because it provides hiding spaces, is easy to climb over, or can be bypassed. 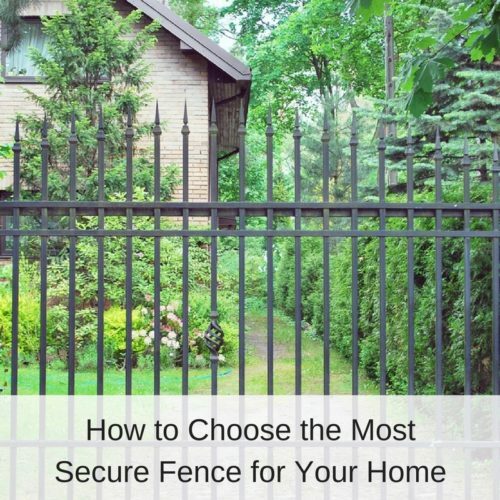 From something as simple as a fully-enclosed picket fence to the additional protection provided by an electric perimeter security fence, here a few tips to help you choose the best fencing option for your home. While an imposing, solid wood fence may seem like the right idea, you want a fence where you can see who’s on the other side of it. Most burglaries occur during the day, and a solid fence will hide a trespasser’s presence from neighbors or people passing by your home. If you love the idea of privacy that a solid fence provides, top it with a trellis to make the fence more difficult to scale. While most cities and homeowners’ associations have rules about how high a residential fence can be, the taller you make your fence, the better it’ll be for security. An 8-foot-high fence is ideal but check the proper ordinances before you get it installed. If you’re limited by height, fences that are spiked or pointed at the top will discourage would-be burglars from climbing them. Be sure that your fence doesn’t have many horizontal rails, which act as footholds for unwanted visitors. If a burglar can go around, under, or through your fence, it’s not providing your home with security. Fence posts should be secured with concrete to keep them strong, sturdy, and unable to be removed or crawled under. Any fencing type you choose should be complimented with a gate. Otherwise, the fence is only as strong as its weakest point — the exposed entryway. The lock or latch should be self-closing without leaving room for a burglar to wiggle their hand through. Be wary of chain-link fences for security, because they’re easy to cut through. The best options for keeping your home secure are typically wire mesh, metal, and electric perimeter security fencing. They’ll add value to your home while keeping intruders out. No matter what fencing type your home needs, you can trust the experts at America Fence to get the job done through honest, quality, and affordable work. Contact us online or call 770-931-4077 to schedule your free residential fence estimate and consultation today.